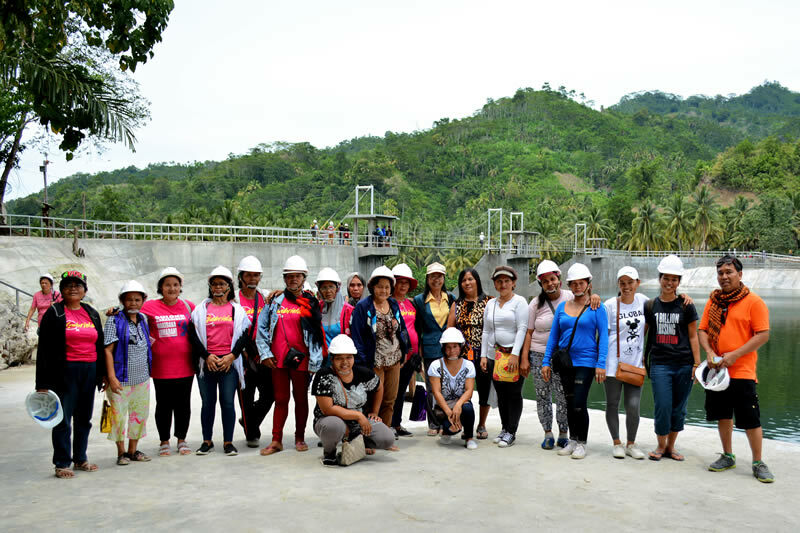 Representatives of Gabriela, Kabataan, urban poor, transport sector, and Pangabugan Punong Barangay visited recently the Taguibo Water Supply Development and Water Treatment Facility Service Project (TWSDWTFSP) in Iyao, Anticala, Butuan City. Also known as the BCWD-THRC PPP Bulk Water Project, TWSDWTFSP is a Public-Private Partnership (PPP) project between BCWD and TwinPeak Hydro Resources Corporation (THRC), operated by Taguibo Aquatech Solutions Corporation (TASC). The project consists of a dam with 64m wide, 15m deep; 1.4m diameter pipeline conveying water from the dam going to the desander or gravity filtration facilities and going to the mainline of Butuan City Water District (BCWD); and gravity filters. The dam was designed to withstand huge volume of flood waters cascading down from the mountain, hence, it can control floods even the strongest one. As of now, the project is on its testing stage, fine tuning the new facilities, and experimenting. It has been found out that there is a need to construct additional six gravity filters to be able to meet the demand. The construction of the additional gravity filters will be completed in three months; hence, the project will be fully operational by the end of the year. The only way to protect the project against natural calamities like typhoons, landslides and other catastrophes is tree planting. TASC is mandated to plant trees, and it has planted 17,000 seedlings already. BCWD is implementing reforestation program in the Taguibo Watershed to protect the Taguibo River, the main water source of BCWD. Approximately 98,000 fruit bearing and indigenous seedlings have been planted to nearly 200 hectares, including the Department of Environment and Natural Resources’ (DENR) National Greening Program (NGP) undertaken by BCWD. The group also inquired whether or not BCWD water is safe to drink. Engr. dela Calzada explained that there are two main processes in maintaining the quality of BCWD water. First is filtration, which concerns on the physical property of water; that is, making the water clear. Second is disinfection, concerns on the chemical property of water; that is, disinfecting, using liquid gas chlorine, the water against harmful bacteria which causes water borne diseases. He assured that BCWD water is safe as it passes through the two processes, adding, that BCWD conducts regularly physical, chemical and bacteriological tests to ensure that the water delivered to concessionaires’ faucets is safe potable water. He also appealed to the group to report to the BCWD Office if they have seen leaking pipelines to maintain the quality of water as these leaking pipelines could be the sources of turbid water along the lines.